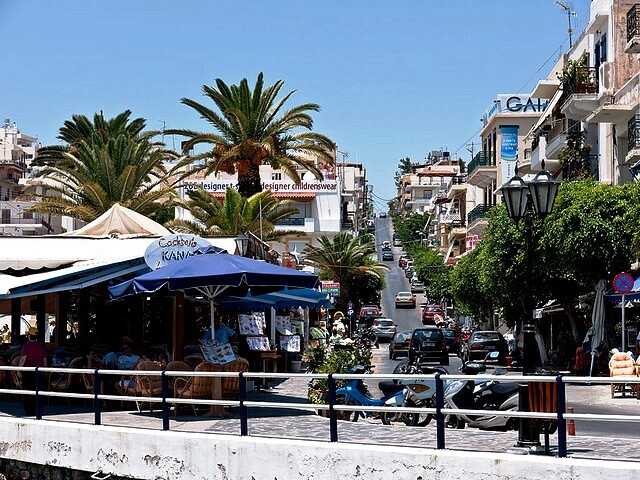 Agios Nikolaos Crete - we love to explore this town and eastern Crete, from ancient sites to magnificent beaches to mountain villages to the township itself, there is something around every corner to surprise and delight in this relaxed seaside town. 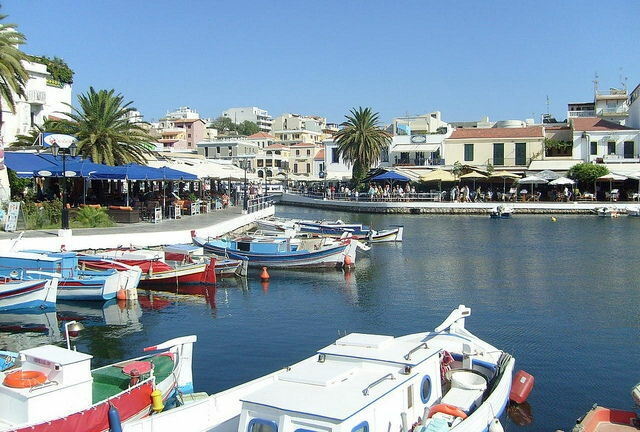 Agios Nikolaos Crete - the capital and administrative centre of the Lasithi Region of eastern Crete. 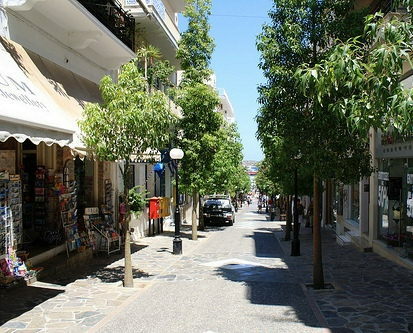 Located 63 km from Heraklion and 60 km from Heraklion Airport, this town keeps its Greek rhythms and character. Take the ferry from here to Karpathos and Rhodes, or take your flight from the domestic airport of Sitia 70 km to the east. 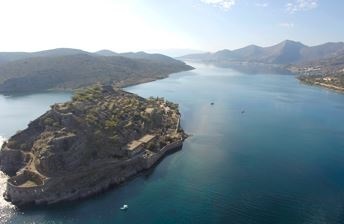 After staying here, we took our ferry to Rhodes from here, and on other trips visited Elounda and other nearby beaches. 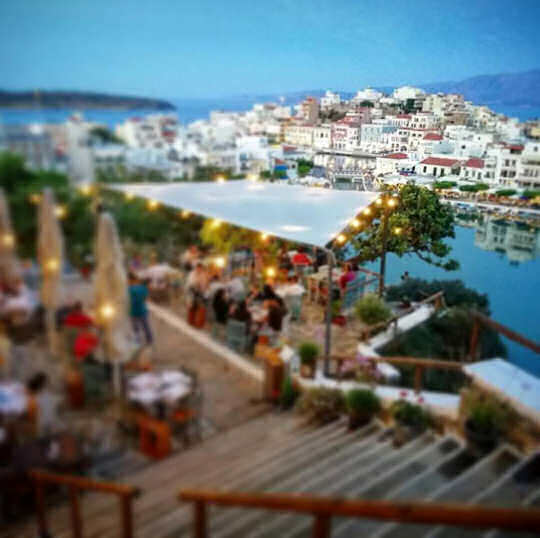 For a day or evening drink with a great view you can't miss Gioma Meze, great food, not just a pretty face. 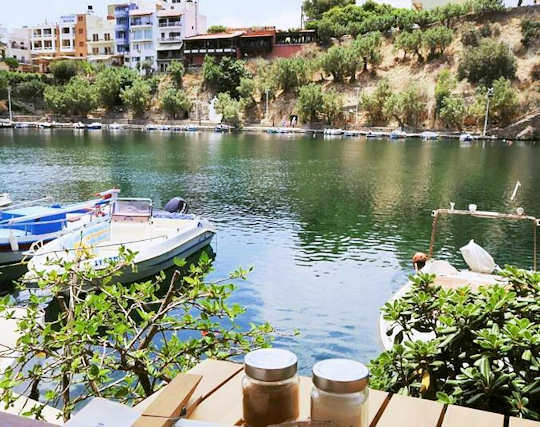 One of our favourite destinations for a coffee is Café du Lac with a wonderful view over Lake Voulismeni. This café bar is popular with locals and travellers and has internet, atmosphere and great music. 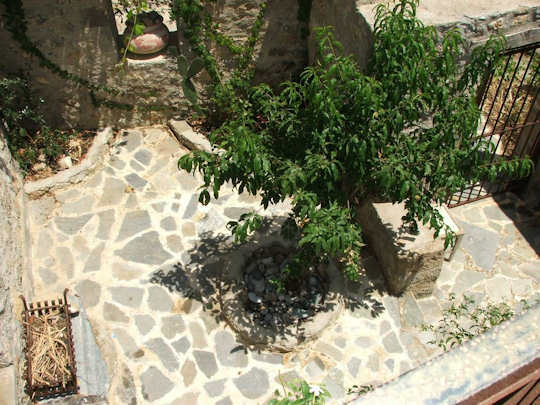 The Avli Taverna serves fantastic traditional mezedes in a relaxing pebbly courtyard with a garden. 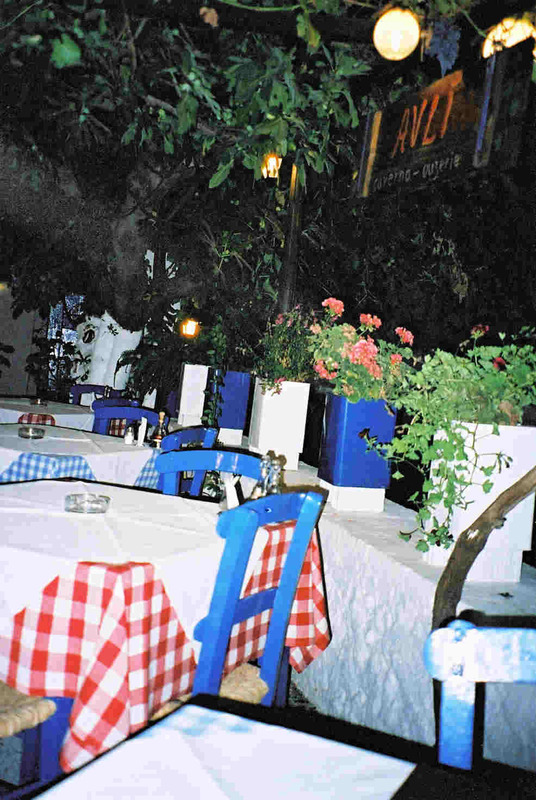 It is the best of Cretan atmosphere with great food and service (right). We also like the Zygos Cafe, right next to the lake, relaxing with a coffee or a few mezedes. Avra Bistro is very busy so book ahead, this is your traditional Greek taverna food at its best, with friendly service and decent prices. There are some dishes to suit international visitors like pizza and prawns provencal. 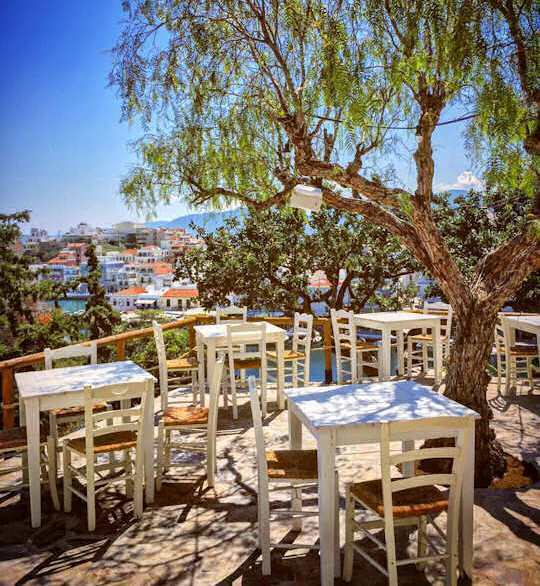 Chrisofyllis is a taverna, ouzeri, a restaurant or mezedopolio, whichever you prefer, located near Kitroplateia Beach in town, with a sea view. Stay for a drink and some snacks or stay for dinner, it is up to you. Try the zucchini flowers and shrimp saganaki. 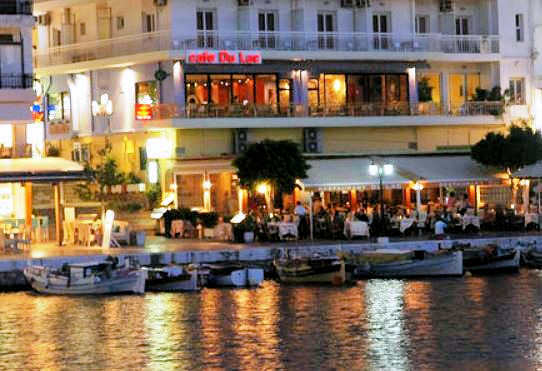 Piato, located on Ammoudi Beach this is a waterside taverna with good service, excellent reviews and plenty of ambience. The speciality is seafood so try the swordfish and the fresh fish of day caught in the very Mirabello Bay you look over whilst you dine. All of this you will find at Pelagos Dive Centre with Stefanos and his team, located at Minos Beach Art Hotel. Sailing out from the harbour of Agios Nikolaos over the clear blue waters into the bright expanse of Mirabello Bay is a must. The Sitia mountains in the distance, the sparkles on the water, and a mysterious island to explore on the Spinalonga Day Tour. Take a full day tour with a BBQ lunch to see some of the unique history of the area and enjoy the natural beauty. The setting by the bay makes this trip worth it just for the scenery. This is a site for serious history buffs, it is not a touristic site at all. This is a genuine ruin set amongst olive groves, next to a dusty track 2 km inland from Pachia Ammos Beach and 20 km south from Agios Nikolaos. There is very little interpretation and no shade or structures, so ensure you take water and sun protection. Best to go early in the hot months. This is a Minoan site first settled in 2300 BC and excavated at the beginning of the 20th century. Minoans were farmers and raised animals, fished and made pottery such as large rhyton vases and tools such as chisels, all found on the site. 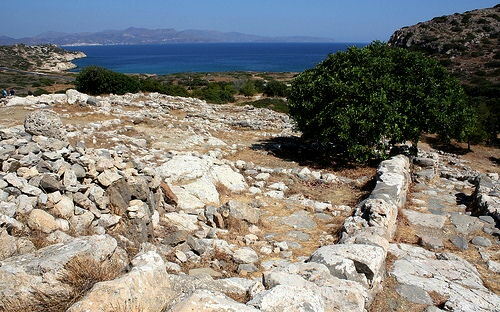 This site is marked as Minoiki Poli on Google Maps, which means Minoan Town. 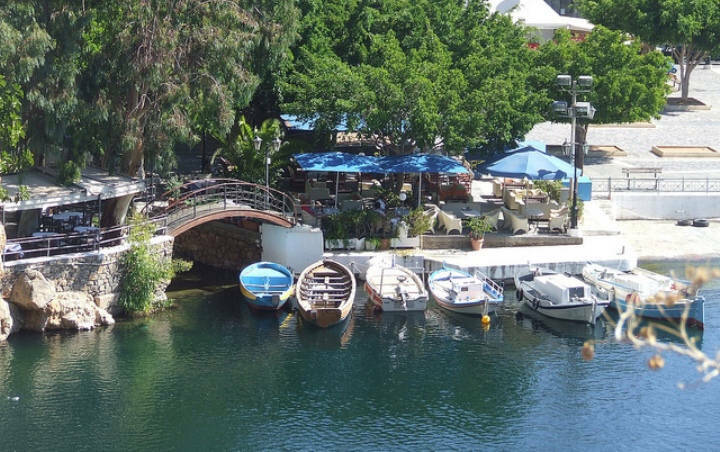 Combined with a visit to Pachia Ammos Beach and perhaps the stunning Ha Gorge, this will make a fascinating day trip from Agios Nikolaos. 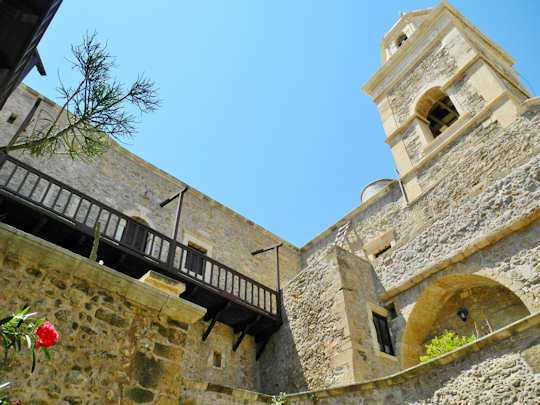 Toplou Monastery - this significant religious, historic and cultural settlement (pictured above) can be reached by car 85 km east from Agios Nikolaos. Housing a museum and winery, the monastery also produces local honey and olive oil, using biological techniques. A visit to the monstery can be included in a day trip to Sitia, Vai Palm Beach and Palekastro Village to explore the Lasithi region. There are no flights to Agios Nikolaos, the nearest international airport is Heraklion Airport HER which is 60 km from town. There is a small domestic airport at Sitia (JSH) in eastern Crete, some 70 km from town, that accepts flights from Athens. Hire a car to enjoy the scenery...take the national road east along the north coast. There is a range of accommodation in the hillside villages and on the beaches all around the region, within easy driving distance from town, with some handy suggestions below. 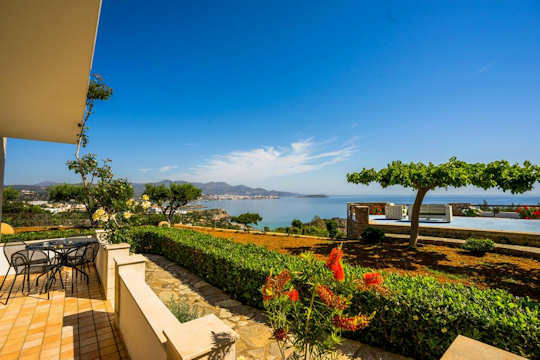 Panorama Villas really do have a panoramic view of the beautiful Mirabello Bay and Sitia Mountains. 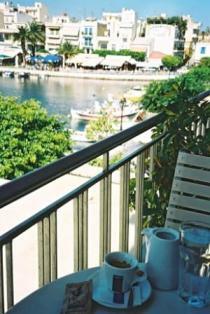 Looking back to Agios Nikolaos, sitting overlooking Ammoudara Beach just 10 km from town. With sculptured gardens, private pool and kitchenettes, these stylish villas are perfect for romance or for family time, and make a great base from which to explore the east of Crete. 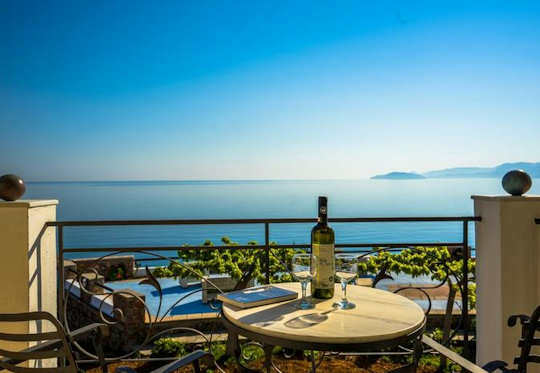 Carob Villa is 50 km south of Agios Nikolaos Crete and sits on its own piece of land with coastal frontage, allowing access to its three private beaches. Set in an idyllic 5 acre landscape, dotted with palm, olive, carob, lemon and orange trees, with gardens full of grapes, berries and herbs. With 3 bedrooms and 4 bathrooms, this villa accommodates 8 guests easily with terraces and patios for outdoor dining. 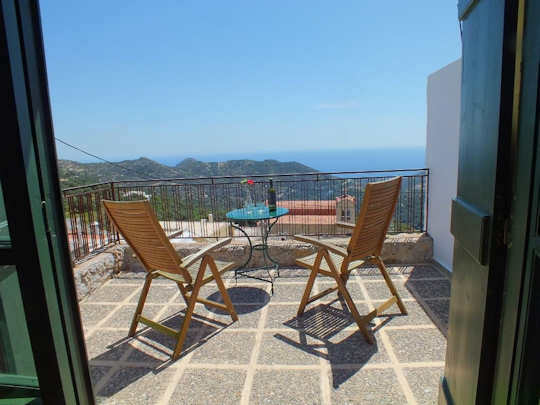 This Mountain Village House in Agios Ioannis is just 40 km from town, with sweeping views over the Libyan Sea and all the comforts of a cozy local home. This 2 bedroom home sleeps 5 people and it is best to have a vehicle to access the village, and drive 15 minutes to the beach. Tastefully renovated with modern touches, this house is characteristic of the area, yet very comfortable for a holiday stay. Enjoy the view from the terrace, hear the sounds of goat bells on the mountains and relax in the privacy of the leafy courtyard. Beautifully remote - experience the real rural life of Crete - whilst still close to Agios Nikolaos Crete. This villa sits inland from Mochlos and Tholos beaches near Sfaka village, 41 km east of Agios Nikolaos. This 2 bedroom 2 bathroom holiday home suits families because of the wide open patios and spaces all around the house, and the gorgeous infinity pool. 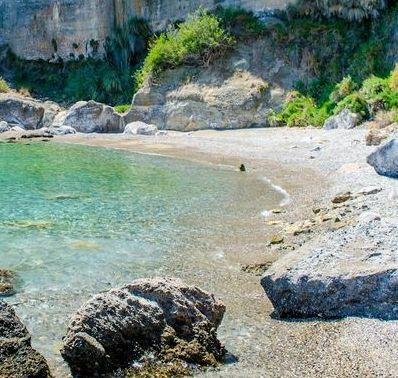 This peaceful location makes a perfect base for exploring eastern Crete, the lesser-known and more natural side of the island.